The cropwild relatives constitute an important resource for improving agricultural production. An analysis of the floras from the Arabian Peninsula shows that there are over 400 wild relatives of some 70 food and forage crops. Because of their natural adaptation to the harsh environmental conditions, these species are expected to be extremely important sources of genes for the crop improvement programs targeting climate change and thus of potential value for global agriculture. 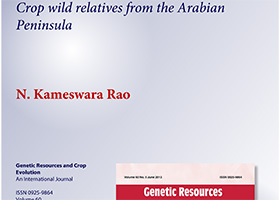 However, these resources are under severe stress from both natural and anthropogenic factors.Considering that efforts for plant genetic resources conservation in the Arabian Peninsula are still meager, there is an urgent need to collect and conserve the crop wild relatives present in the region.